All Uncle Tobys breakfree Cookies are made with Sunola oil, a monounsaturated sunflower oil. Uncle Tobys breakfree Cookies are big on taste, but are also low in saturated fat, making them a healthy alternative to traditional cookies and biscuits. The cookies are available in Apricot & Almond, Apple & Pecan (both less than 10% fat) and Choc Chunk (12% fat). The Apricot & Almond and Apple & Pecan cookies are an Australian first to achieve the Heart Foundation's Tick of Approval, containing less fat, saturated fat and salt compared with other products in this category. Uncle Tobys breakfree Fruit & Yoghurt bars are low in fat (97% fat free) and made with real fruit  an ideal snack to maintain energy levels throughout the day. The Fruit & Yoghurt bars are available in Apricot and Mixed Berry. Uncle Tobys breakfree Toasted Oat Bars are tasty high carbohydrate bars individually wrapped for convenience. All three varieties are a source of dietary fibre, helping consumers to achieve the daily-recommended intake of 30 grams. They are available in Golden Honey, Roasted Coconut and Nut Delight. 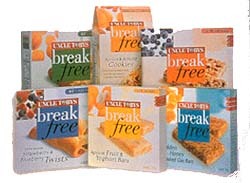 Uncle Tobys breakfree Oven Baked Fruit Bars and Twists are excellent tasting low fat (97% fat free) snack choices. Both are a source of dietary fibre, low in fat, made with real fruit and come in a variety of flavours. Oven Baked Fruit Bars are available in Apple, Apricot, Blueberry and Raspberry; while the Oven Baked Twists range includes Apple & Blackcurrant; Strawberry & Blueberry and Apricot & Pear and Strawberry & Yoghurt. Uncle Tobys breakfree Fruesli Bars contain delicious real fruit combined the goodness of oats and wholegrains. Low in fat (97% fat free) and made with Sunola oil, Fruesli Bars, available in Apricot, Blueberry and Appleberry, are a perfect nutritious snack. Click here to read more about Uncle Toby's studies on who eats snacks!